I’ve been playing with the new Microsoft WebMatrix IDE. It’s a very neat little piece of software that takes the effort out of many things. It’s great for small Web projects. The problem with out-of-the-box WebMatrix development is that it encourages you to use direct SQL programming with embedded SQL queries. The world has moved away from embedded SQL queries in favor of object-relational mapping and (domain-un-specific) query syntax such as LINQ. I wanted to test out using LINQ2SQL with WebMatrix. 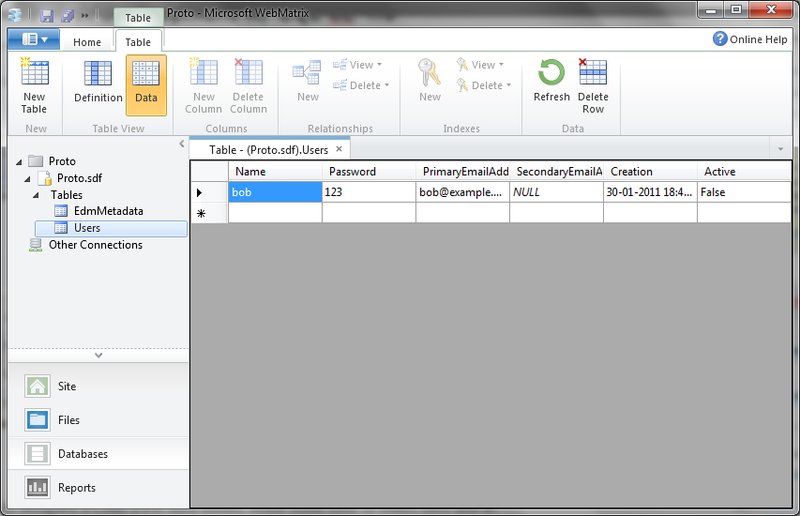 The tool to use when doing Database-First LINQ2SQL development is called SQLmetal. It queries the database schema and generates mapping classes (one class per table) that allows one to use LINQ syntax in C# or VB.NET directly against the source data. The problem, though, is that SQLmetal does not appear to work with SQL CE 4.0. So, what to do? Microsoft’s next-generation O-R mapper – Entity Framework (EF) – is one possibility. Entity Framework uses the Entity Data Model (EDM) as its conceptual mapping framework. It is the Model-First and the Code-First approaches that I find most interesting. In this case I chose the Code-First approach because it appears easier to work with without any tooling support. So what do we need to work with Code-First and SQL CE 4.0? Then we need to setup a basic project. Let’s just make a C# console application. That settles our external dependencies. Now onto the data modeling. The attributes are pretty self-explanatory. We need one more thing in order to be able to use this, a DbContext-derived class that references our User domain model class. That’s it. We now have a new Entity Framework-generated SQL CE 4.0 database with data. It was generated from a simple class modeling our simple domain. I don’t think the Entity Framework Code-First CTP API is quite as nice as it could be though: setting a static property on the DbDatabase class to use a specific database driver is not that clean. It’s global state and we don’t like global state. Let’s try and open the new database in WebMatrix and see what happens. So, we’ve designed a Code-First data model. We’ve made some code to insert data into a database fitting this model. The EF code automatically generated a SQL CE 4.0 database when no previous database file existed. 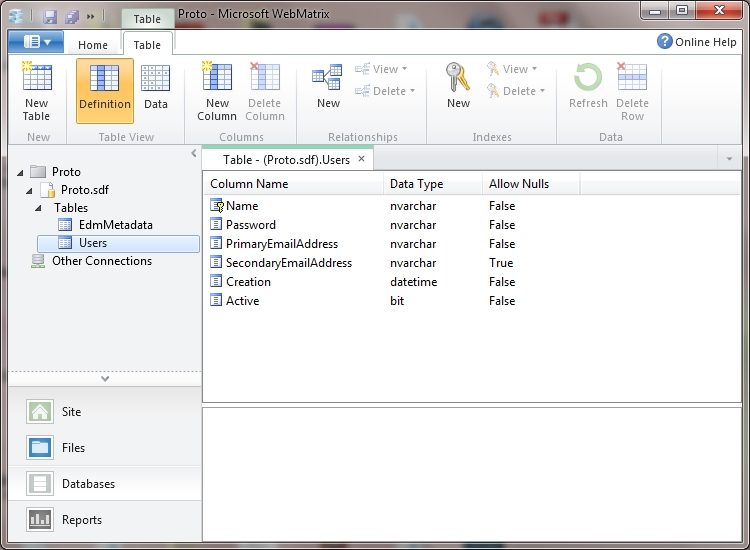 And finally we’ve seen the database schema and data inside of WebMatrix. This entry was posted in Datamodel, Declarative, Imperative, Paradigm, Software, Technical and tagged Code-First, Community Technology Preview, Compact Edition, CTP, Domain Model, EDM, EF, Entity Data Model, Entity Framework, LinkedIN, LINQ, LINQ2SQL, Microsoft, Model-First, ORM, SDF, SQL CE, SQL CE 4.0, SSCE, WebMatrix. Bookmark the permalink. Nice post! Also another way of providing the DefaultConnectionFactory is by adding this in the app.config.